Brielle: Why is the church not completly holy? Why is the church not completly holy? The Church is holy but not completly holy. The church is hokt because Jesus is very holy and is the body of christ and the holy spirit is like the breath of christ. The holy spirit dwells in ums all the time while we are living on earth but the church is not completly holy because we are not completly holy. We are not fully holy because we are still on our pilgrim journey. WALT: Explain how the church is holy but not perfectly holy. 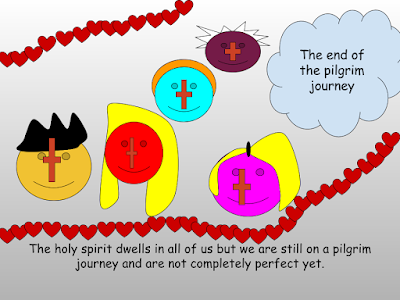 Here is my picture showing how the church is holy by the holy spirir that is in us but also we are not fully holy because we are still our on our journey. I think i did my pictures well but next time i think i could be a little bit more creative with how i set out my pictures.